Call for Submissions to 2nd Edition of “OUR FOOD OUR RIGHT”! Do you think about the importance of organic agriculture to the American food system? What it means to call someone a ‘foodie’? How food is produced world wide? 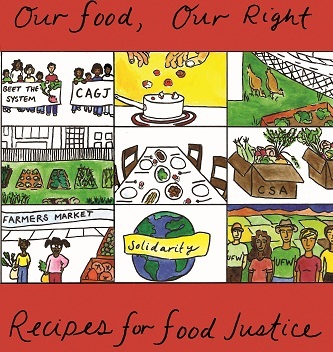 In November of 2009 CAGJ’s Food Justice Project published “Our Food Our Right: Recipes for Food Justice”, a guide to our current food system. It was received so well that in 2011 we will be publishing a SECOND edition!! Our Food Our Right aims to educate and inspire readers with fresh/simple recipes, how to grow your own organic food, and stories of food justice and food sovereignty movements from around the world and locally. Additionally, it offers suggestions to further food justice education and take back our food choices. We want to continue to include all of these great themes in the second edition – but we need help! You know what’s going on out there, so we need YOUR meaningful ideas and stories. Submissions could include recipe ideas, stories of Food Justice movements, art – illustrations, photographs – how-to’s etc. And please get in touch if you would like to get involved in any other capacity – we need artists, editors, graphic designers, etc! Let’s make the next addition of Our Food Our Right even better than the first! You can also submit ideas through our online form.